Only £10.00 at New Look now! I also got a black one with red and green embroidery from Primark… yes I know. I had an attack of guilt on the way home for even going in there. I might take it back, I’m not sure. Thoughts? They have supposedly improved their ethics… but I still feel guilty. Now this ‘dress’ was fine to wear for a shoot, but I had to pin it to my bra as the bodice is very strangely constructed. The back extends into long sash pieces, which I crossed over and then tied around my waist. But it would not stay up, and it could not be tied in such a way as to make it stay up, at all. There would be no chance a woman could walk around in it without quickly becoming indecent! hm. maybe you can get a tailor to sew you some straps to the dress so it holds up? shouldn’t be too hard to do that, and it would be sad not to be able to wear it as it is supposed to.. pretty as it is! oh i love the first one. damn i whish i was in london so i could buy one! 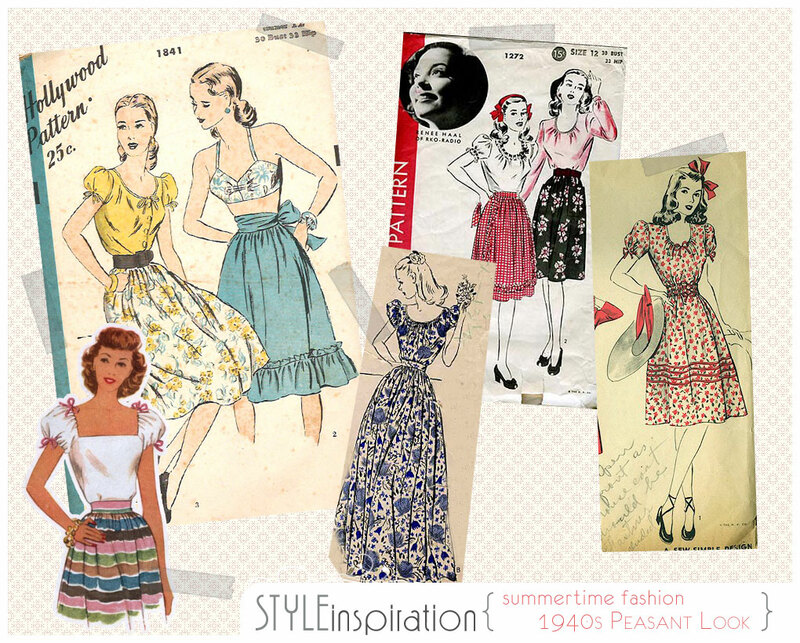 lovely post, love the vintage floaty 40’s look, it suits you. What a strangely constructed skirt! I bought a peasant top a couple of weeks ago, as well… for a whopping £9. I’ve yet to photograph it for my blog though! You look absolutely lovely in the photo! I agree with Fröken Lila – you could add straps. Or maybe some kind of structure or “boning” on the bodice. It really looks adorable as a dress. Aw… thanks for mentioning my post as inspiration–I’m so tickled!!! 😀 That first top is gorgeous (I love those embroidered, peasant tops. I would love to make one eventually!). Thanks all for your thoughts – I must confess to being a bad vintage wearer, in so much as that while wearing the dress on this shoot, the constant tugging it up to keep it in place (even pinned to my bra I had o keep yanking it up) has cased the bodice to rip quite badly where the material was already weakened parallel to the top edge. So skirt it is from now on! So many high street shops are a bad choice ethically though, and I almost feel a bit defensive of Primark for being always in the front of the firing line. H&M garments are almost exclusively made in Bangladesh in very similar conditions to Primark's but I've never heard a bad word said about their ethics. Your new top is adorable, cant wait to see pictures of you in it. I would have never guessed about the dress you wear as it if it was sewn for your body. I love this look and enjoy the blog post Casey did as well – good reference. But I wonder, am I too old for this summer look? The girls in those adverts seem so young and I am 40+++. What do you think Fleur, I always trust your judgment when it comes to 40’s fashions! hi! i’m a new reader, and i have to say; you’re an inspiration! i really, really, really adore your style! wish i could be in london to grab some of those cute tops! If you think you’d feel that guilt every time you wear the top, take it back! It’s only worth keeping it it’s pretty enough to outshine your ethical worries..
first skirt looks alike my dress!